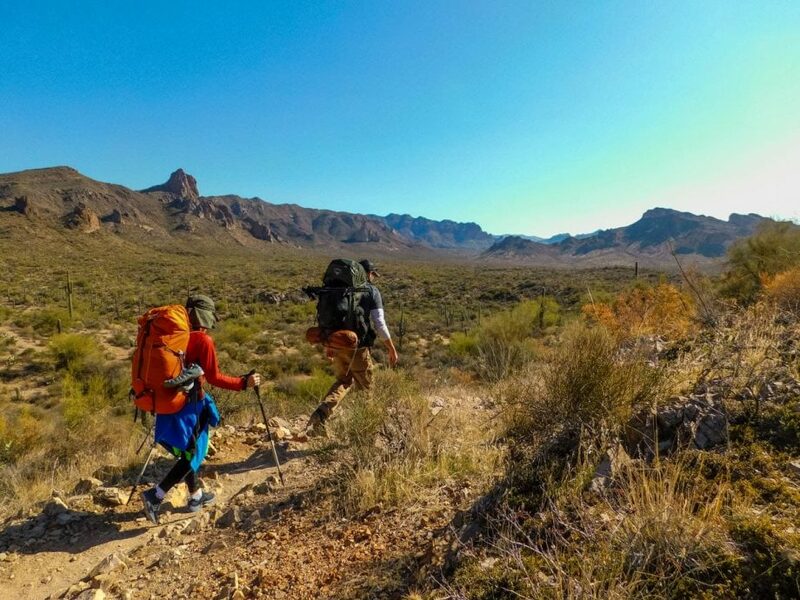 Only one hour away from bustling Phoenix, the sixth largest city in the United States, you’ll find miles and miles of incredible hiking trails that locals consider some of the best in the Sonoran Desert on our Superstition Mountains Wilderness Backpacking trip. The Superstition Mountains Wilderness offers towering Saguaro cactus, boulder-filled canyons and soaring, jagged peaks. 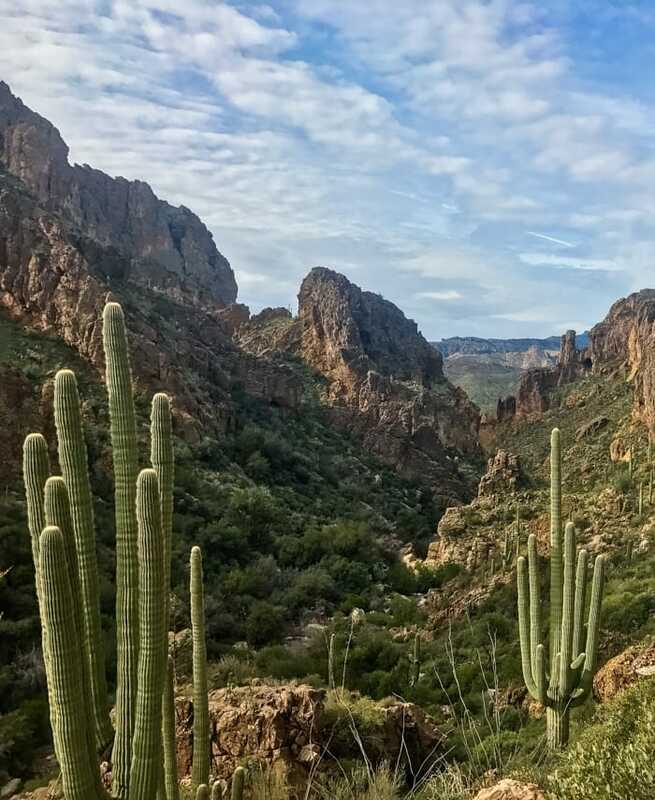 Combine some of the best hikes in Arizona and the legend of the Superstition Mountains, and you have the perfect recipe for a winter backpacking adventure. With the help of your guide you will work on your backpacking skills, learn about the flora, fauna, and geology of the area, as well as the fascinating and mysterious legend and folklore of this mountain range. 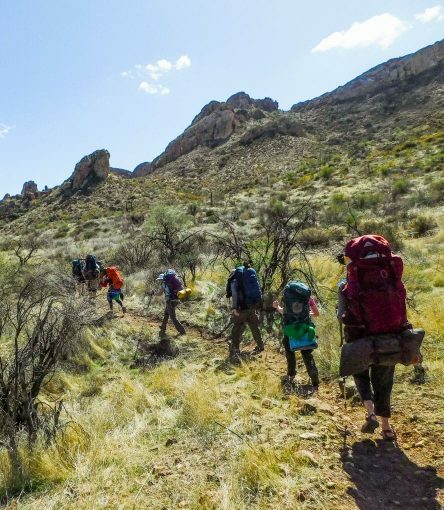 Join us on a 3-day Superstition Mountains Wilderness backpacking adventure near Phoenix, Arizona. 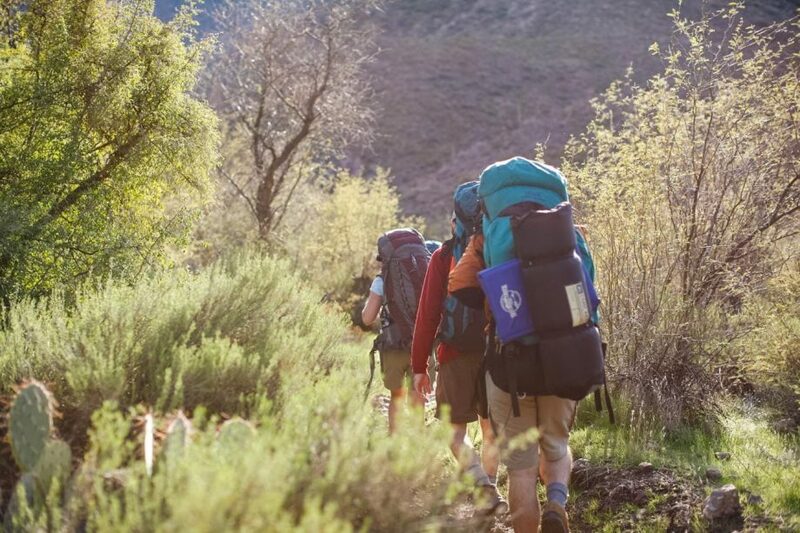 With the help of your guide you will work on your backpacking skills, learn about the flora, fauna, and geology of the area, as well as the fascinating and mysterious legend and folklore of this mountain range. Get lost (figuratively not literally!) in the wilderness area rumored to have hidden gold mines and secret maps. Trip Start: Meets in Scottsdale, AZ at 7am on day 1. Trip End: Ends in Scottsdale, AZ between 5-7pm on day 3. 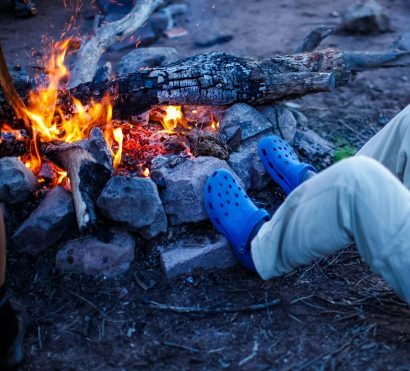 DAY 1: Begin Your Superstition Mountains Wilderness Backpacking Trip! Meet your guide in the lobby of the Holiday Inn Express in Old Town Scottsdale at 7:00am. Here your guide will do an orientation and distribute gear. 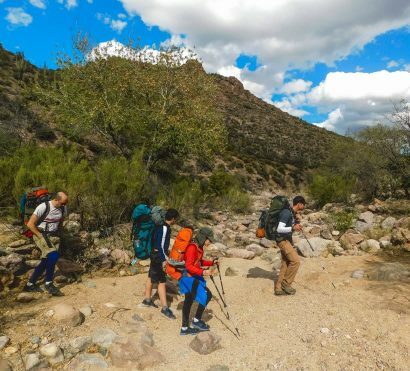 Once your backpacks are all squared away, you’ll depart for a short drive to the Peralta Trailhead at the base of the Superstition Mountains where some of the best desert backpacking opportunities exist. Just an hour from the heart of Phoenix, this popular trailhead quickly transitions us from rush hour to the quiet solitude of the Sonoran Desert. Hiking past towering saguaro cactus, we’ll follow a ridgeline before dropping down into a basin where we set up camp. Tonight we enjoy a campfire (USFS restrictions permitting) and a delicious guide-prepared dinner beneath the stars. After coffee and breakfast in the morning, we’ll break camp and begin to stretch our legs on the rocky Red Tanks Trail. Now deep in a remote region of the Superstition Wilderness Area, we’re likely to see some wildlife on our trek today; black-tailed jackrabbit, whiptail lizards, red-tailed hawk, and many others call this place home. We’ll do lunch on the trail to fuel us for a steep climb to a stunning vista where we can take in the whimsical desert terrain around us. 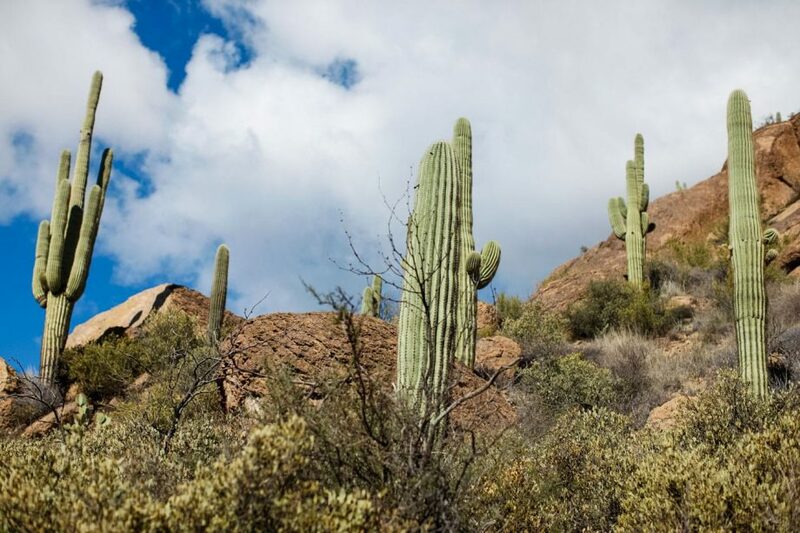 Surprisingly lush, the Sonoran Desert has more species of plants and animals than any other desert in the world, including many native plants used by Native Americans as food and medicinal sources as they traveled this same route. Tonight we enjoy our final night of solitude while listening to the great-horned owl announce sunset. Dinner has a celebratory feel as we share stories of the trail with our new friends and adventure companions. 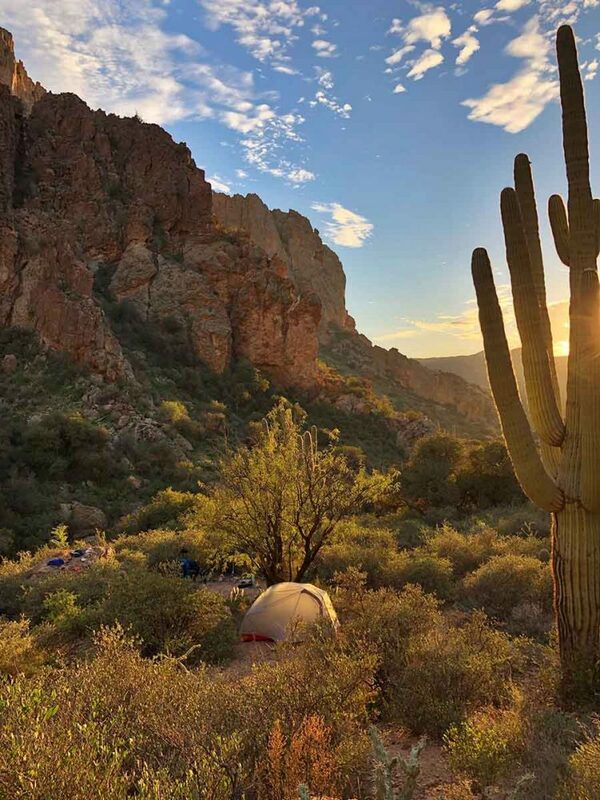 Our campsite affords us a perfect view of sunrise over the saguaros! Having settled into a backcountry pace dictated by nature’s own timeline, we enjoy breakfast before donning our packs for our final day on the trail. Today’s route completes our loop via the Whiskey Springs Trail. From here we can see Miner’s Needle, a monumental rock spire left over from when this region was just a massive chain of volcanoes and cinder cones. By midday we drop back onto the Dutchman Trail and retrace our first day’s steps to find trail’s end at the Peralta Trailhead. We transfer back to our host hotel, arriving between 5:00 and 7:00pm. Although we’ve left the wilderness behind, we take with us a feeling of accomplishment and memories of our adventure together. Cell service: While backpacking in the Superstitions, you will not have cell phone service, you should expect to be unreachable by phone. There is no electricity available. Bring a portable battery to charge your phone for photos. Bathrooms/Showers: During this trip we will not have access to showers or bathrooms. We will use a WAG Bag system to pack out our waste and ensure we Leave No Trace. Access to water: Water is a precious resource in the desert. We will filter our drinking water from reliable springs and must carry large quantities with us at all times due to scarcity. 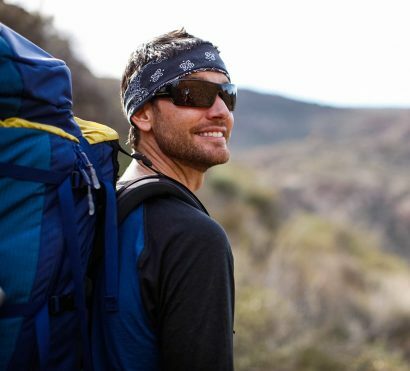 This backpacking trip requires that you carry all you need and a portion of the group gear on your back. Expect to carry about 35-50lbs in your backpack. The second day of this trip is long and challenging. The Superstition Mountains are rugged, we will be hiking over exposed and unmaintained trails through thickets of cactus and other plants. Gaiters are highly recommended.